On October 1, the School of International Service’s Forum for Climate Engineering Assessment (FCEA) released a report titled “Governing Solar Radiation Management.” The report is the result of a two-year process in which prominent environmental policy researchers from the US, Europe, and New Zealand convened multiple times to debate the proper objectives of Solar Radiation Management and the best way to meet them. The report and the process of convening the workgroup exemplify American University’s emerging position as a leader in sustainability and environmental policy research. We caught up with Simon Nicholson, SIS professor and co-founder of FCEA, to ask him a few questions about Solar Radiation Management and what this report will tell us about managing it. What is Solar Radiation Management? Solar radiation management (SRM), or solar geoengineering, is a proposed method of responding to climate change. The idea is to reflect a little bit of sunlight back into space before it can warm the planet—for example, by depositing tiny reflective particles in the upper atmosphere or spraying salt into clouds over the ocean to make them brighter. The technologies to do this don’t actually exist yet, but some scientists argue SRM could become a useful supplement to cutting greenhouse gas emissions—though they’re also quick to emphasize that SRM is by no means a replacement for emissions reductions. Is SRM in the mainstream of climate change solutions? Why is this the right time to consider how SRM might be governed? Research into SRM is moving ahead without adequate oversight or deliberation. The lesson from other emerging technologies is that it’s important for governance to stay out ahead of the technology. In the case of SRM, the world just isn’t ready to govern SRM research or the technologies it could create. Existing institutions can govern different bits of it here and there, but there’s currently no coherent means of governing the whole enterprise. It’s going to take time to develop those institutions, which means we need to get started. We’re also at a crucial moment in the conversation about SRM. Up to this point, research into SRM has been almost exclusively theoretical—computer modeling, social science, that sort of thing. At least a couple of research groups are now talking about taking their research outdoors and doing some small-scale experiments to better understand whether and how these technologies might work. There’s no direct environmental risk from these proposed experiments, but they’re an indication that we need to get the ball rolling on governance, too. How did this Working Group come together, and what makes it special? 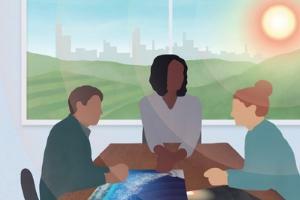 The Forum for Climate Engineering Assessment wanted to bring new voices into the SRM conversation, and we wanted a group that could produce actionable recommendations based on a deep understanding of how governance works. With that in mind, we invited global governance experts who hadn’t previously worked on this issue. We convened this group for five meetings over more than two years and brought in many of the world’s leading experts on SRM to inform their deliberations. In the process, our working group has made themselves into experts on SRM governance. At the end of that process, while they remain divided on the ultimate wisdom of SRM, they’ve coalesced around a set of near-term steps that should be taken regardless of where you stand on SRM. We’re really proud of the report that they’ve produced, which advances the governance conversation from one about principles to one about the essential next steps the international community, national governments, and civil society can take to begin governing SRM. What are the main recommendations contained in the report? The report offers twelve recommendations about essential, actionable steps that international organizations, national governments, and civil society can take to govern SRM over the next five to ten years or so. Those recommendations fall into three buckets: creating politically legitimate deliberative bodies to facilitate an inclusive, international dialogue about whether and how SRM might fit into global climate policy; leveraging existing institutions, such as the institutions in the UN system or national-level climate assessments, to govern SRM more effectively; and making research transparent and accountable. What do you hope policymakers take away from this report? We want policymakers to recognize that the time to start governing SRM is now and that there are essential, actionable steps that they can and should take in the next few years to begin doing so. How can a report like this one affect policies that impact people? SRM isn’t something that’s going to happen tomorrow. But if it were ever developed and deployed, it would literally change the world forever. Every single person on Earth would be affected by it. While that’s still a distant prospect, the decisions we make today will shape whether and how SRM technology and the tools for governing it get developed. This report points policymakers in the right direction. I can easily imagine my kids’ generation facing world-changing decisions about using SRM. The world will need institutions capable of making those decisions wisely. The actions recommended in this report would lay the foundation for those institutions.